As I've mentioned, these only came in yesterday, so I still need to have my way with them. But this is a first look, pre-swatching of the items I've bought: a single eye shadow in Antique Gold and a duo named Peacock. I suspect that there are more in my near future, though I'll probably stick to neutrals. That purple is something, though. 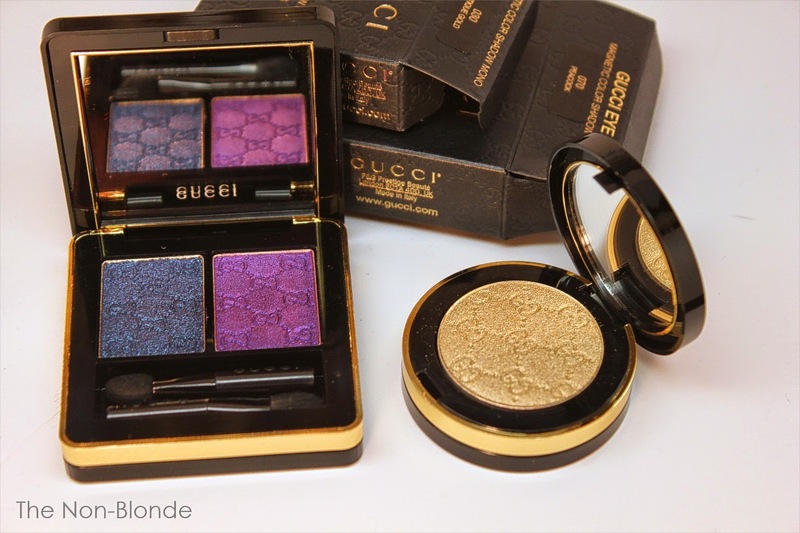 Have you bought any Gucci makeup? Are they available in your local stores or did you have to order online? I bought one of the quads,Tuscan Storm, after seeing the swatches Sonia / SweetMakeupTemptations posted. Hopefully it will arrive this week! I haven't taken the plunge yet because I've read a number of reviews which were far from stellar as far as the lip products go--bad smell and a lingering soapy taste. Hopefully, other products will prove to be better as it is always fun to explore a new line. I'll be looking forward to your review. I have one of the eye shadow quads in my cart at Neiman Marcus. It will be backordered until November according to them. I'm going to order it as soon as my gift certificate comes in...in about 3 weeks. Hope they're not sold out.